Eighty8 Phnom Penh i Phnom Penh, Kambodja : Boka nu! Good atmosphere and amazing Staff, super friendly! Can't recommend highly enough! I loved it at eighty8! Staff is super friendly, a great common area. We actually extended our stay a couple of days because we enjoyed it so much. 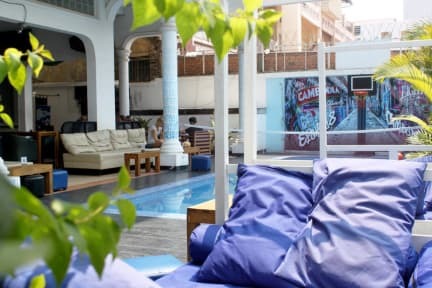 I’ve stayed at mad monkey in Phnom Penh as well but it is a lot more relaxed at eighty8 you can choose whatever you would like to do (eat, relax, drink, play pool, swim). Thanks for a great week // J-J and Johan, 2 happy Swedes! Arrived in the night, left early in the morning, which made me a bit full of envy (since we missed the breakfast buffet which looked awesome), alright rooms, not the best planning of showers in the toilet so it's always wet outside the toilet. Plays loud music that goes through all walls in the bedrooms, hopefully you're not too light of a sleeper. Basic hostel with a good atmosphere. Food places close in the evening in the area, so you have to walk for a bit to get something to eat. It's about a 10 minutes walk to the night market. Also watch out for the extra tax fees when you book, cause it's not very clear. Unfortunately we also found bed bugs in our bed. But that varies from room to room and bed to bed I'm sure, just a head up! Good place to stay, easy to get tours & busses from here. I got a dorm that faced the pool & bar area so it was very noisy for many hours.